American Steel Span is the largest manufacturer of metal buildings in the world. Metal building construction is an economical solution to your building needs and metal buildings are easy to assemble and go up in half the time of conventional construction. If you are in the market for a metal building, American Steel Span has four models from which to choose. American Steel Span’s metal buildings come in a wide variety of sizes with options that will meet your every specification. 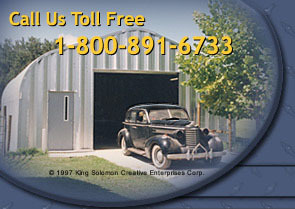 All metal buildings are not created equal. American Steel Span's metal building construction utilizes materials that are corrosion resistant and carry a 25 year warranty against rust-through perforation backed by the steel mills. The components of each metal building that American Steel Span manufactures are designed with durability, functionality and appearance in mind.